Canvas material upcycled and repurposed into watch band that can fit in apple watch. Includes brand new aftermarket Apple watch connectors. 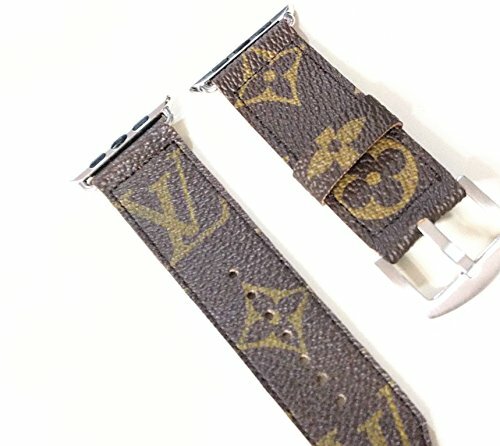 Watch band is size 42mm with silver hardware. The canvas used is upcycled from a vintage authentic LV bag. Canvas is hand cut and stitched together with industrial sewing machine. Canadian designed & handcrafted. My products are lovingly made in a smoke free home. DISCLAIMER - This product is made from upcycled and repurposed authentic canvas materials. It's was created, designed and handcrafted by myself. Due to the handmade nature of this item, there maybe some slight variations in color, print placement, size and color of monitors. All canvas has been authenticated by Memes Treasures before use. If you have any questions about this product by QWear, contact us by completing and submitting the form below. If you are looking for a specif part number, please include it with your message.